The Big Idea: Everyday moments and routines are filled with wonderful opportunities to build children’s brains. Keeping kids busy, engaged, and learning throughout the day can be hard work! 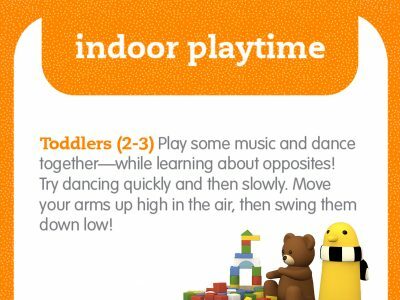 These cards offer easy ways to build children’s brains during activities you’re already doing and to make routines more exciting, educational, and enjoyable for both of you. Parents and other caregivers can share cards and talk about activities that they’ve tried with kids at home and at childcare, to help build on children’s learning and interests.